Wanna fall in love this weekend? Write a romance novel in a weekend. You’re a history prof. Now all you need is a cape, unrequited passion, some heather. But what happens if a real live hero walks into your life? And he’s a professor of love. You’ll never look at romance the same again. And that may be a good thing. Read it this weekend. 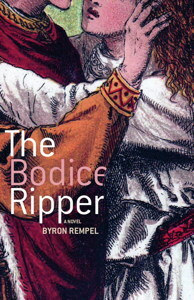 Byron Rempel’s The Bodice Ripper. © 2017 Byron Rempel. All Rights Reserved.